Hey all, Ernie here with a piece from Andrew Egan, who last hit us with a tale about game theory. This time, he takes us in a truly magical direction. 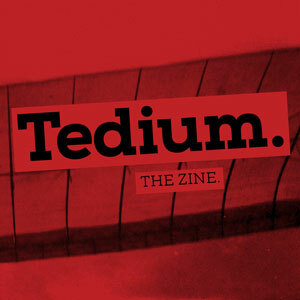 One last chance: The second issue of the Tedium zine is almost done—and I’m about to send it to the printer. Want one? Support us on Patreon at a $5 level or above by Saturday to get your hands on one. (There’s also an $8 tier for international fans!) It’s Tedium in your inbox—in the literal sense. The year that The Discoverie of Witchcraft was published. Written by an English Member of Parliament, the book was one of the first attempts to explain the techniques behind stage magic. Reginald Scot’s schematics are available here. If you can follow them and pull off the trick, you’re probably a better magician that Scot ever realized. Like any small detail worth a closer look, one thing leads to another. 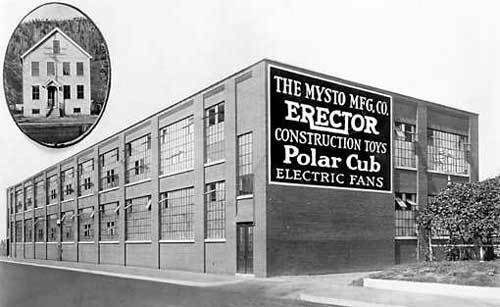 As it turns out, one the first American manufacturers of magic kits was also the guy who created the Erector Set. While certainly not the first to sell magic tricks, Mysto was arguably the first to market specific kits aimed at teaching kids how to do basic illusions. A.C. Gilbert, the founder of Mysto, had put himself through Yale University as an amateur magician, performing at various social gatherings. By the time he graduated, Gilbert decided to focus on his new magical toy company rather than pursue a career in medicine. This was probably best for everyone as A.C. Gilbert would become known as the “man who saved Christmas”. America’s mid-century production boom saw an explosion in consumer goods, including toys. There were lawn darts, G.I. Joes, pedal cars, and Barbie dolls. Board games snuck their way through laying the foundation for generations of family arguments. A.C. Gilbert wanted to create things that interested him, as he thought it would be interesting to kids. The result was chemistry sets, build your radio kits, and magic sets. While Gilbert’s magic sets introduced scores of children to their first practical illusions, the company’s biggest success was an engineering toy that would go on to become a blockbuster. Erector Sets were one of the first must-have toys kids needed to see under the Christmas tree, lest their faith in Santa Claus die. By the early 1950s, the now A.C. Gilbert Company was earning roughly $20 million in revenue (more than $187 million in 2017). Beyond the success of Erector sets, it is easy to see why A.C. Gilbert was able to generate so much revenue from his toys. 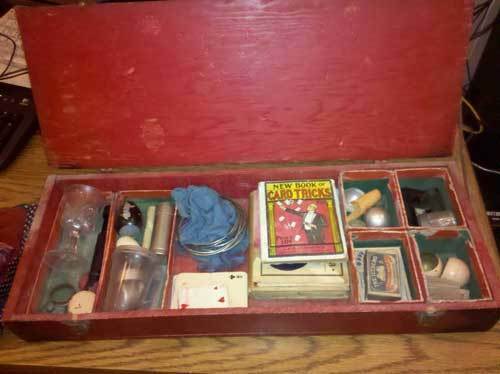 This one magic kit below was sold by then Mysto in 1929 to 1930 for a grand total of $7.50, which was a staggering $110 in 2017. In between the trinkets and bobbles, the toys and the games, a few kids gravitated toward magic kits like the few who wanted chemistry sets. And still, there were others raised in the old tradition that wanted a piece of this lucrative new form of magic merchandising. The amount of money it costs today for an autographed copy of Harry Blackstone Jr.’s 1983 edition of “The Magic World of Blackstone”, a magic kit marketed for people of varying skill levels. While exact numbers are difficult to pin down, Blackstone’s magic kits are considered to be among some of the best selling of all time. Magic kits are a strangely divisive topic. Simple collections of tricks are how many people learn to do magic. However, the existence of these kits was offensive to some in the first place. In modern magic circles, some see the merchandising of magic kits as a form of selling out. To be fair, modern criticism tends to focus on poorly constructed illusions for absurd prices. But the criticism is all too familiar. Secrecy is a fundamental part of magic, to a degree that begs for parody. There is a reason magicians are incentivized to keep their tricks of the trade to themselves. The “Art of Misdirection”, a website for magicians, has been called “the most closed site in the world” with some 600 people that reportedly have the ability to login. Access is limited to those that demonstrate significant skill with various illusions and secrecy is paramount. Any violation is met with a ban. But adhering to the code can pay off. That is just objectively cool. One of the big reasons for modern secrecy surrounding magic is that many illusions and tricks are technically copyrighted work. The manuals describing how to do them are protected intellectual property that belongs to a specific magician that created it. It’s piracy on a level that even the pirates agree is taboo. Magic kits occupy as strange a position in the magic world as magic does in the real world. Their existence violates one of the core tenets of the community while bringing in new members that keep it alive. Aside from magic kits in general, the sale of individual, singularly created magic tricks seem to be perfectly acceptable to the larger community. Edward Massey was a beloved magician and inventor that created many illusions that magicians learn to this day. Perhaps his most popular was the Finger Chopper trick. Massey sold the prop behind the trick to Holden’s Magic Shop, who went on to patent it. While many of these illusions require some skill to perform, they rely on props to complete. Other types of magic, like those involving cards and coins, require significant practice to execute convincingly. Yet another piece of 90s nostalgia that some immediately recognize and others wonder what you’re talking about. The Magic Works series created by Milton Bradley is on the simpler side of magic skill. In total they offered 30 tricks, like “Clean Cut”, “Twisted Pencil”, and “Severed Skeleton”. A whole lot of the commercials for these individual tricks are available online and totally worth a quick binge watch. In general, these were toys meant to mimic stage magic. Neat tricks that don’t require a whole lot to do something impressive. There are niche companies that sell instructions and props for individual illusions that are impressive and difficult to pull off convincingly. Japanese company, Tenyo, offers a range of instruction manuals for tricks that include, pulling a handkerchief through a mobile phone and an alleged 4D printer. Illusions involving mobile phones are, of course, among the latest trends in magic. Perhaps as predictably, the magic community wonders whether it counts as “real” magic. There’s a reason for the secrecy behind the magic community. Practically, an innovative trick that a single magician holds exclusivity over might lead to significant financial rewards. Maybe even fame. It’s why, for example, one of the better running gags in Arrested Development was the idea that Gob Bluth had been blackballed by the Alliance of Magicians for revealing his tricks. But there’s more to it than that. A magic trick can elicit shock or induce an eye roll. The “danger” in magic kits is that they reveal how something that appears impressive actually isn’t. As a public seeking to be entertained, we’re amazed by magic tricks only so long as we don’t know how they were performed. At least all the hate for that masked magician in the late 1990s finally makes sense. Find this one an interesting read? Share it with a pal! And by the way, hit up the Patreon page if you want a zine! Andrew Egan is yet another writer living in New York City. 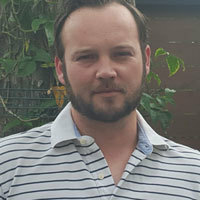 He’s previously written for Forbes Magazine and ABC News. You can find his terrible website at CrimesInProgress.com.